John Tappin goes through his pregame routine. Bastrop linebacker John Tappin may be the most underrated linebacker in the state. He does everything that a linebacker should do. John is smart, quick, explosive, a great tackler, very athletic and gives effort on every play. It’s also pretty hard for a linebacker in high school to get 70 total tackles in a season but John had 70 solo tackles in one season which is pretty rare for a high school linebacker or for any other linebacker. Don’t be surprised if John gets a lot of offers by the end of the year. “John is under the radar,” Lee Brecheen said. “If he was 6’1, he would be an All-American. He’s fast, athletic, and a big time outside linebacker. He will sign with a D-1 college by the end of the year. John’s a great football player.” John is the real deal and Bastrop has a better chance of competing with the Nevilles of the world with him playing defense. Get to know John a little more as he talks about his game, his motivation to play the game of football, and this upcoming season after having a successful season last year in today’s recruiting interview! John Tappin (5) shows blitz in a game against Shiloh Christian which is a high school in Arkansas. My name is John D. Tappin III. I’m 17 and I play linebacker. I’m 5’10.5 and I weigh 211 pounds. LAFM: What’s your 40 yard time, max bench press, max squat, and vertical? My best 40 time was a 4.68. My max bench press was 315. My max squat 415, and my best vertical was 25 inches. LAFM: Did you attend any football camps over the summer? If so, what are they? 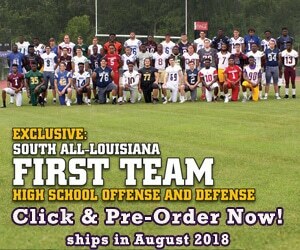 I attended University Of Louisiana at Lafayette & Central Arkansas football camps. LAFM: Do you have any offers from colleges? If so, what are they? No, I haven’t received any offers yet but I’ve been heavily recruited by Louisiana Tech, ULL, UCA &Arkansas State. It’s been going pretty well. I’m just patiently waiting for offers. LAFM: Is there any advice you would give to a player about the process? I would just tell them to be patient, remain humble, and always put in extra work you never know who’s looking at you. LAFM: What were your stats and accomplishments last year as a football player? My stats this past season were 72 solo tackles, 11.5 sacks, and Honorable Mention All-District. LAFM: What motivates you to play football every Friday night and why? I play hard for my deceased friend because I know if he was still here he would be playing hard as well. LAFM: Do you have a pregame ritual? Yes, I listen to my game day playlist, take a 30 minute nap, and say a prayer for the team’s protection. LAFM: Last year, Bastrop won 10 games and made the second round of the playoffs. What would be considered the next step for the team this year? The next step for our team is to try to rebuild and get our underclassmen ready for varsity. LAFM: Last year, the team won every game on the road which is very hard to do. How did the team accomplish that last year? We were able to win all of our away games last year because we came with a mind set of “Who said we can’t win here “. LAFM: The team was one game away from winning the district championship. What’s the key for the team to beat a great team like Neville in your district? The key to beating Neville is that we have to prepare more in the film room and just play Bastrop Ram football. LAFM: What are your individual goals as a football player this year? My individual goals are to be better than I was last year in every aspect of the game especially taking more part into the vocal leadership role. LAFM: Who was the best player that you faced last year and why? The best player I faced last year is Edna Karr’s, Tyrin Ralph, and he’s just that type of player to make a play whenever the ball is in his hands. LAFM: What was your best football game at Bastrop? The best football game I’ve played was my first game back from a wrist injury. I recorded 3 sacks and a few tackles. LAFM: What are your strengths and weaknesses at playing linebacker? My strengths at playing linebacker are: 1) I can dissect a play before it happens 2.) I’m pretty quick moving laterally 3.) I’m a sure tackler in open space My only weakness is letting my feet die when shedding blocks. LAFM: You are one of the best linebackers returning from last year in the state. Is there any other linebacker on Bastrop’s team or any other defensive player we should look out for this year? We have a few guys to look for on our defense such as a young corner in Philip Jackson, Free Safety Charles Mullens, and we also have a promising senior running back in Ja’Cari Jones. LAFM: What college or NFL player do you compare yourself to and why? I compare myself to Ryan Shazier, a middle linebacker for the Pittsburgh Steelers, because we both have a willingness to make a play on every single down. My father, John Tappin Jr., played at Northwestern University and went on to play for the New England Patriots. LAFM: What separates yourself from any other linebacker in the state? I feel as if I’m a playmaker and I have a desire to be great and there’s nothing that can stop me.